Treatments for oral cancers create eating and swallowing issues for patients. During treatment, radiation and chemotherapy create painful mucositis sores that make eating by mouth difficult to the extreme, and many times patients are put on various types of feeding tubes directly into their stomachs while the worst of the treatment process and subsequent healing is taking place. These feeding tubes can be part of a patient’s life from a few months to a couple years before they are able to transition back to normal eating. Eating blended meals during treatment and recovery can be used to supplement the patient’s nutritional needs when oral intake of solid foods becomes intolerable. Even those on PEG feeding tubes can create their own liquid formulas from real foods to get better nutrition than from the canned supplement materials available, and potentially reinforce their immune systems while getting a more balanced nutrition, returning to health, and maintaining body weight through this process. Not every patient is able to return fully to eating normally. The treatment for this disease can impact nerves that control the swallowing reflex, and patients can develop aspiration issues and dysphagia. Some of these issues can be moderated through physical therapy and work with a swallowing specialist. While some patients are able to live on an oral blended diet, others will live on a PEG feeding tube system for the rest of their lives, by-passing the oral intake of any foods. OCF has recognized the very real need for a blender that can produce a smooth and thin enough liquid to be used in PEG feeding, and turning the toughest of things like even meats into a liquid diet. We have developed a relationship with Vitamix, manufacturer of the premium, high power blenders that are capable of creating the consistency of foods that work in these situations. Vitamix has been the blender of choice in commercial kitchens and used by high-end chefs. Their top of the line machines are the ideal piece of equipment to satisfy this very demanding application that oral cancer patients and survivors face. While their product line is diverse, one machine within their offerings has satisfied all the criteria that OCF and its PEG tube dependent advisors have set out. While it has several different designations depending on the outlet that it is being sold through, OCF has chosen the model 7500 as the machine that we will promote to our patients and their families. The features of this unit that influenced our decision were many. It has the raw horsepower to liquefy the most difficult food items. As one of the company’s most recent introductions (a “next generation” model) it has a quieter motor. It has a mixing bowl that when on the motorized base is shorter and wider to fit under a home cabinet system, where the upper cabinets are usually mounted 18 inches from the lower counter top. (Other units more suited to commercial kitchens where over cabinets are not part of the design, have to be stored as two separate pieces as they are taller). It has a larger diameter blade than some of the other models, the tips of which travel at a faster speed when sitting on the same size motor, and this produces a very liquid consistency in a very short period of blending. It has a variable speed dial, and pulse system for uses in conventional food preparation. There are other models that have programs in addition to these features, but OCF finds them more suited to someone that is cooking and blending at the same time as a commercial chef might, and those programs to our type of users do not add significantly to the end result for the added cost of having them. The unit is very easily cleaned in just minutes without disassembly of the bowl and blades, making it idea for someone that may use it several times a day, every day of the week. All Vitamix blenders have an industry standard 7 year warrantee on new units, and 5 year warrantee on refurbished units. This is an American made product built by a company that stands behind what they sell. These blenders are not inexpensive, and when compared to department store blender standards (machines which are not up to the task of liquefying things to the degree needed for getting the blend through a PEG tube), but they are no ordinary blender. Realizing that not every person who may end up needing a piece of equipment with these special capabilities can afford to purchase one, OCF has developed a medical needs program to provide these at no cost to a small number of people each month who can qualify for our donation program. It involves documentation from your treatment team that you have a medical need caused by oral cancer which is a permanent post treatment condition, and documentation of a financial disparity such as being on permanent disability that would preclude affording this premium kind of equipment. Click here to fill out an application to see if you qualify for OCF’s program. All doctor’s letters and financial status will be verified by phone before any units are gifted to patients or survivors. As a small non-profit charity, the foundation has limits on how many of these we can afford to gift to those in need each month. In the hopes of making this a long-term sustainable program, OCF is also retail selling both new and factory refurbished units, the small profits from which will be funneled back into our medical needs program. Please note that this is an important component of the long-term success of this idea. Vitamix does not allow discounting of their units by any dealer, so purchasing a machine from OCF costs the same as if you purchased through Amazon, or Williams Sonoma or any other dealer that they sell to. But we hope that you will consider when buying a unit for your family’s use, that selecting OCF as the source for your unit will do good in the world, and not cost you one cent more than purchasing from another source. 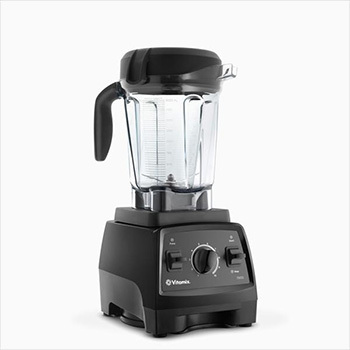 Vitamix blenders, outside the world of patient needs that we are talking about, are the blender of choice when considering a purchase for your family’s health. There are numerous online sources that speak to the health benefits of blending whole foods vs. juicing and what that adds to your family’s nutrition, and resulting health and well being. 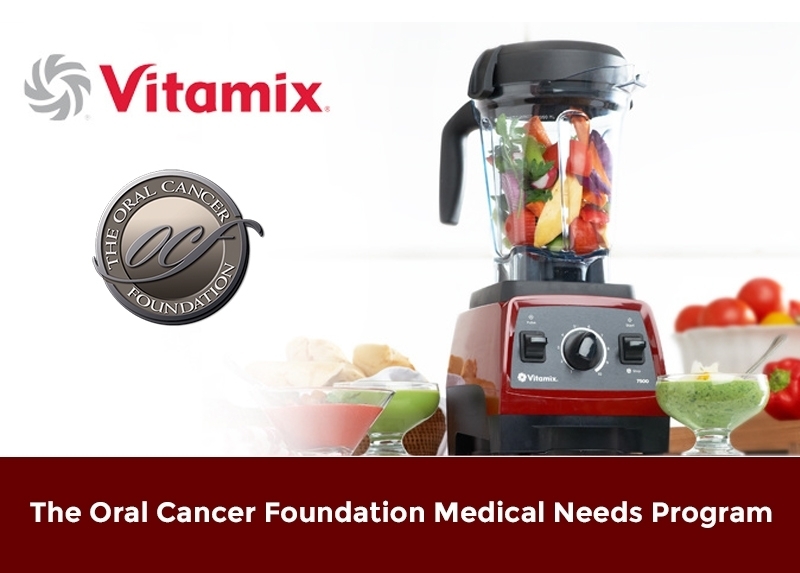 OCF highly recommends that you consider the purchase of a Vitamix blender, even if the oral cancer / eating issues are not part of your world. The versatility of the machine will make it one of the most used appliances in your kitchen. Whats included in every order. The Simply Fresh cookbook package is a full-color, hard-bound book that contains hundreds of recipes. The Getting Started guide contains introductory recipes and techniques chosen by our culinary team to help familiarize you with your new Vitamix machine. As part of your cookbook package, you’ll receive Getting Started, a tutorial DVD illustrating all the basics. The Tamper is included to help you process thick mixtures like peanut butter and frozen desserts. It fits securely into the 64-ounce container with a special collar designed to prevent it from hitting the blades. We are available Monday through Friday 9:30AM to 4:00PM Pacific Standard Time. All orders ship direct from Vitamix. Once you receive your unit you will register for warranty and all service requests directly with Vitamix. Learn more about the 7500 Blender here. Learn more about the Vitamix new unit warranty here. Learn more about the Certified Reconditioned 7500 Blender here. Learn more about the Certified Reconditioned warranty here. Learn more about the reconditioning certification process here. We are so certain that you will see the value and benefits of using your Vitamix machine each day, that Vitamix is pleased to offer a risk-free, 30-day, in-home trial—this apples to new or refurbished machines. If you are not completely satisfied and don’t find Vitamix to meet your expectations, simply return it within 30 days for a full refund they will will even pay for return shipping. Vitamix stands behind its products and their commitment to your satisfaction is a top priority. If you wish to return a product within the 30-day trial period, contact Vitamix Customer Service for a return authorization number.